(Nanowerk News) A new article in the Journal of the American Chemical Society (JACS) describes how nanoparticles formed by very small numbers of silver atoms can protect against the cell damage caused by ethanol ("Silver Sub-nanoclusters Electrocatalyze Ethanol Oxidation and Provide Protection against Ethanol Toxicity in Cultured Mammalian Cells"). The study was led by researchers from the University of Barcelona and conducted in conjunction with the Magnetism and Nanotechnology laboratory of the University of Santiago de Compostela. The top left image shows the actin cytoskeleton of the control astrocytes; on the right, cells exposed to ethanol, showing alterations to both the cell morphology and the actin cytoskeleton. The bottom images show the effects of applying silver nanoparticles; on the right, the ethanol causes no alteration of the actin cytoskeleton. "The results of the study show that these clusters of small numbers of silver atoms catalyze ethanol oxidation at similar concentrations to those found in the blood of alcoholics and at values of membrane potential and pH that are compatible with those exhibited by mammalian cells," explains Gustavo Egea, a professor with the Department of Cell Biology, Immunology and Neurosciences of the Faculty of Medicine at the UB and an affiliated researcher for the Institute of Nanosciences and Nanotechnology (IN2UB) and the August Pi i Sunyer Miomedical Research Institute (IDIBAPS). Alcohol has particularly harmful effects on nerve cells, and in the specific case of astrocytes it induces programmed cell-death and an alteration of the actin cytoskeleton. 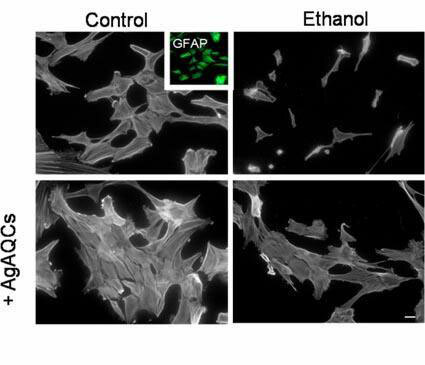 Following application of the silver nanoparticles to ethanol-exposed cells, the actin cytoskeleton shows marked improvements and cell-death does not occur. "So, the harmful effect of ethanol on astrocytes is mitigated by the silver nanoparticles, which act as a cytoprotective agent," explains Javier Selva, a lecturer with the Department of Cell Biology, Immunology and Neuroscience and first author of the paper. The study combines analysis of the electrocatalytic properties of silver nanoparticles with examination of their potential biological applications. "This is a promising field in electrochemistry applied to cell biology, which harnesses the different properties of nanoparticles formed by very small numbers of atoms, referred to generically as atomic clusters," explains Gustavo Egea. The authors have also found that the nanoparticles prevent alterations induced by other primary alcohols such as methanol and butanol, although not those induced by other toxins such as hydrogen peroxide.